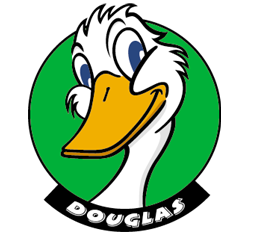 Douglas the Duck is the charmer of the Grab a Pig card game gang but also likes to have a good joke. Douglas always knows what to do or say to make any situation go his way. He always makes all the girls swoon and is very popular with the children, who are often seen around his pond. He spends a lot of time swimming. Douglas is a very cheeky chap and will often help Hortensia if she is planning a practical joke on one of their friends. Douglas is happiest when he is playing a joke or flirting with the girls. When he is with his friends playing the Grab a Pig card game he will always be the one who is making the most of the game’s bluffing rule! I’m Douglas the duck. During the day I spend loads of time at the pond, I love to swim and entertain the children. They bring me fresh wholemeal bread to eat, they are wonderful. From my pond I can see Cordelia and Hortensia if they are in the paddock, Henrietta too, although she often is sorting her girls out in the hen house. Sometimes she gets very tense, but she comes to the water’s edge and we soon have a laugh together. In the spring and summer when it is nice and warm I sleep down by the pond at night. In the winter though, or if it is raining, I will often sleep in the henhouse with Henrietta as it is warm and dry. I love it when we all get together in the evening to play the Grab a Pig card game, it is great fun. I love to bluff and I usually manage to get my friends to lose a life using the Grab a Pig card game’s bluffing rule.